It is 15 degrees F (approx -10 C). The sun is bright. The sky is a brilliant blue. There are no clouds. There is no wind. We have fresh snow, so the sun glints off of countless facets. It is the sort of day that those who don’t live in snowy climes may not be able to appreciate, and those who do often forget to appreciate. construction workers who work outside all day all winter long. garbage trucks blocking the road so I can practice my cyclocross skills. the lake near my house that becomes a massive and nearly private park in the winter. After skating on the street last Sunday, I skiied across the lake this Sunday. Steve (a different Steve) and Kevin, who stuck with me through thick and thin (and thinner) on a long and hard day in the heat and headwind. Anders, who picked up a new helmet for me at the end of said long day, so I could ride again the next day. the entire Cycle America staff, for handling the logistics so we could ride. A special shout out to Ed (a different Ed) for delightful surprises on the routes; and to Dan, who never met a hill he didn’t like. 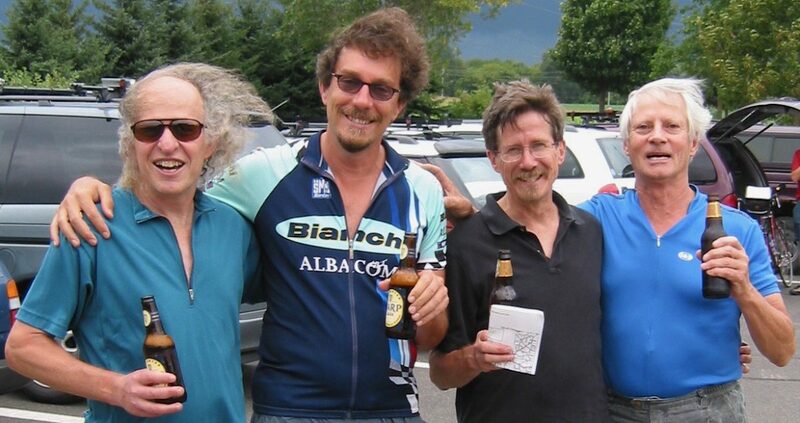 the half-fast cycling club, including those I started riding with more than 40 years ago, and those I haven’t yet met. the glaciers which all managed to miss the driftless area, making for great bike riding in the area of the Horribly Hilly Hundreds (and to HHH, as I just learned that I was selected in the lottery to ride this year). the Parks Department, for plowing the bike paths. getting old. I’ve seen a lot of folks the past couple of weeks with broken ribs from slipping and falling on the ice. Many tell me how horrible it is to get old. I think it beats the alternative. When I was a kid we looked forward to the arrival of the big mail-order catalogs from Sears and Spiegel. We referred to them as “wish books” and pored over them to figure out what Christmas gifts to ask for. Nowadays (I never thought I’d be using that word) catalogs seem to arrive on a daily basis. Some companies (you know who you are) send catalogs every week. I was looking for a suitable image (hoping to find a Norman Rockwell-esque image of kids lying prone on the floor, feet in the air, looking at a catalog) to go with this thought but, instead, came across the gift I wanted for years and never got (and it’s not a Daisy Red Ryder carbine action two-hundred shot range model air rifle). It was a fake car dashboard so I could pretend to drive – one with working horn, turn signals, and windshield wipers. My parents thought it inappropriate. Kids shouldn’t drive ’til they’re 16, and driving is not a game, but to be taken seriously. Funny that I hardly ever drive now. Anyway, last week I found myself looking, not through Christmas catalogs, but through listings for cross-state bike tours. While I know it will be years (if ever) before I can ride across the country again, maybe a state or two would suffice. A couple of riders from the Twin Cities last summer wore a variety of jerseys from South Dakota rides. South Dakota had some great riding, so I’m looking there. (Greg and Dawn, if you’re reading this, tell me what you think of some of those rides. Or were all your jerseys from Nebraska? You’ll have to do some fast talking to convince me to join you for that one.) The Finger Lakes and Adirondacks were great fun, so I’m looking at New York rides. One of these days I’ll do the GRABAAWR (Great Annual Bicycling Adventure Along the Wisconsin River) and I’m thinking about RAW (Ride Across Wisconsin), a one- or two-day ride across the state. And maybe it’s time to return to Cycle Oregon, which I rode in 1992. My summer 2019 travel budget will be taken up by nieces’ weddings out west, so I’m already thinking about 2020, with 2019 spent on day rides around here. Of course, 2020 is also the next Cycle America ride, which I won’t be on, though I may either join them across Wisconsin or buy them all a beer in Baraboo. If you’ve had a great (or terrible) experience with an organized cross-state or regional ride, tell us about it in the comments. So this post was written a couple of days ago and waiting to go up tonight…I’m listening to Astral Weeks by Van Morrison and realizing what this time was like musically 50 years ago – fall 1968 saw the release of “The Beatles” (AKA the White Album), “Beggar’s Banquet” by the Rolling Stones, “Memories” by Richard and Mimi Fariña, and the aforementioned “Astral Weeks”. Oh, and “Electric Ladyland” by Jimi Hendrix. An embarrassment of musical riches. And that’s just off the top of my head from stuff I’ve listened to recently. I first read of Paul Sherwen’s death in another blog I follow, A Dude Abikes. Sherwen, for those who don’t follow bike racing, was what we in the US would refer to as the “color commentator” for BBC and Eurosport TV broadcasts of bike races. Analogous to American football broadcasts, they employed a retired bike racer (Sherwen) to provide inside commentary along with a broadcast journalist (Phil Liggett). Though unlike the usual team, Liggett was also a former bike racer. count on a shot of the riders in a field of sunflowers during the Tour de France. Since I’ve never had cable or satellite TV, access to their broadcasts was always an adventure. In 1992 I watched their TdF broadcast from a cafe somewhere near Markleeville, CA., home of the Death Ride. When I first heard of the Death Ride, I thought one had to be nuts to try it. I may still be right. The ride is ~200 km (129 miles) on California highways, climbing 15,000 feet while summiting five mountain passes. The low point of the ride is about 5000 feet and the high point over 8700. The best part is that it’s a closed course for the most hazardous parts. I changed my mind about the crazy part when I went cross country skiing and camping in the area. As we drove over Carson Pass on our way to the trailhead I was amazed by the beauty, and thought it would look even better on a bike. Over the next few days of backcountry skiing and camping, I began to hatch a plan. I decided to get my feet wet in 1991 with the “two pass option”, riding about 50 miles and crossing two passes, to find out what riding at altitude was like. I’d never ridden anything higher than the Santa Cruz Mountains, at about 2000 feet. I learned an important lesson. Arriving the night before the ride I had no time to get used to the thinner air. I was tired and had no appetite. It was hot and dry. It was not my most enjoyable day in the saddle. The morning of the Death Ride I was up before dawn and headed to Turtle Rock State Park, the start point. As the sky got light, the strains of Jimi Hendrix playing the Star Spangled Banner reminded anyone who was sleeping in that they’d best get up to start riding soon. As we headed toward Monitor Pass, it began to sprinkle lightly. This seemed like a good omen, a little something to keep the heat down and counter the dry desert air on the leeward side of the divide. We went up and over Monitor Pass and down to the Nevada state line, then turned around and went back over the pass in the other direction. So far, so good. As we turned toward Ebbetts Pass, the earliest riders were coming down. They warned us that it was cold and wet up there. Climbing the pass wasn’t so bad. At the top, no one stood around to rest or enjoy the view. It was time to head down. Employing my modern version of the age-old technique of stuffing newspapers in your jersey for insulation on chilly descents (I used a plastic grocery bag – no ink to run, and waterproof), I was back on my bike after a quick snack and collecting the sticker to prove I’d made it to the top. Collect all five and your receive an enameled pin to prove you did it. We were cautioned that there were corner marshals before all switchbacks, urging us to slow down. I’d seen them going up, when slowing down was not a problem. Going down was a problem. The brakes needed feathering to scrub off speed as well as to scrub water off the rims so they would actually function as brakes. It was also a way to keep fingers moving so they wouldn’t stiffen up too much to apply the brakes when really needed. Breathing on the fingers for warmth had to be done fast, so the hands could be back on the brake levers before the next switchback. The lunch stop was welcome this time and we headed back out on the road. Coming down a few thousand feet did not make it warm and dry. The rain had entered the valley and was with us the rest of the day. Sorensen’s Resort was on the way to Luther Pass, so I stopped into our cabin, dried off, changed clothes, ate a banana, hugged my future wife, and got back out. It might have taken all of five minutes. Dry clothes felt great for the next few minutes. After the last two passes, I showered and changed into dry civilian clothes and signed the commemorative poster as a five pass rider. Since it was still raining, I don’t know if you can read any of the signatures. We used a silver Sharpie so it was somewhat waterproof. After one last great meal at Sorensen’s, we headed back to the Bay Area. I think I’m ready to do it again.